A few weeks ago, Mr. Abel came in to do his Cake Smash session in my studio. This little guy was absolute perfection from head to toe, and he was so excited for his photo session! Abel is the youngest of four, and for his birthday he wanted a Paw Patrol party. 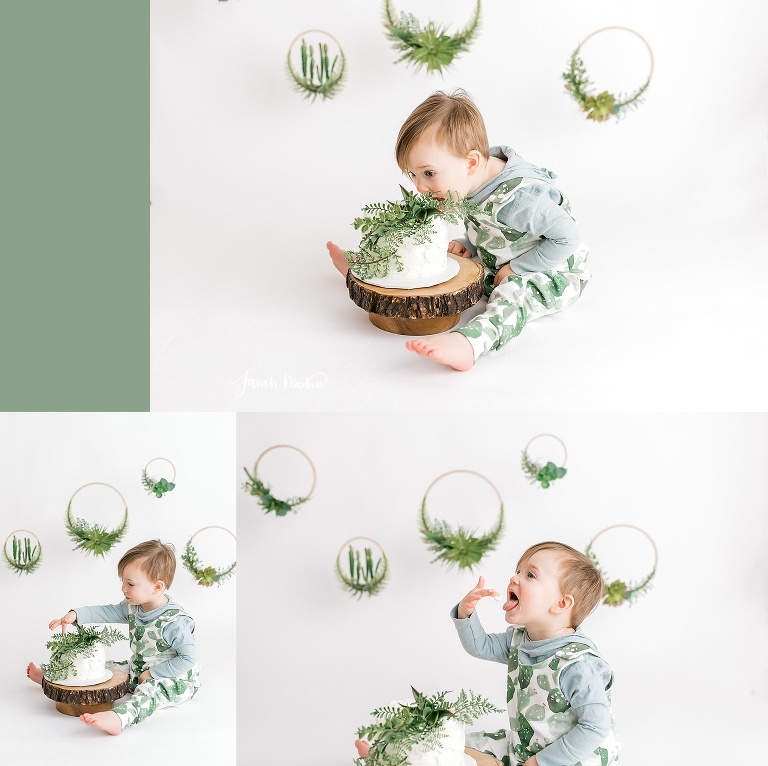 For our session his mama decided to go a little more to her style and we came up with a simplistic organic theme. I made the succulent hoops you see in the background, and of course my sister over at Frosted Flour Co made his cake! The wood stump cake plate was perfection with this cake smash session. I have to say this is a really special session for me, and I’m so excited to be sharing it with all of you! When we first moved to Belleville, I hired Abel’s mama to do our fourth son’s newborn session. I was interested and dabbling in photography, but had not really taken the leap of faith to start my own business. She was so encouraging about my passion, and if it wasn’t for her I don’t think I would have had the confidence to start my business page. 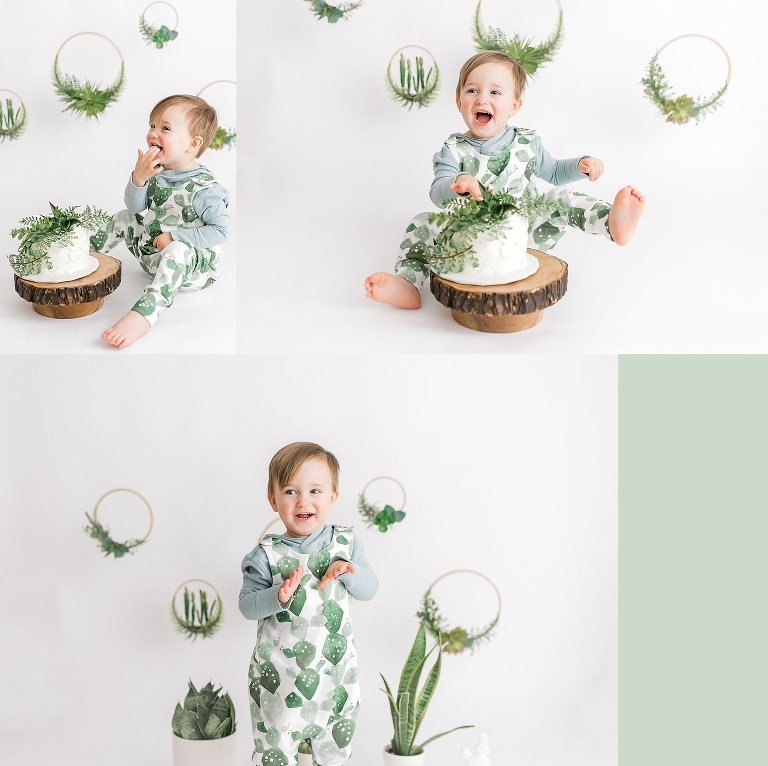 Abel’s overalls went perfectly with the session’s decor! When he showed up in those I knew this session was going to go down as a favorite. Abel was the perfect model in front of the camera. You can’t help but smile when he smiles, and I know these photographs are going to bring joy for many years to come for this special family. After celebrating such an important milestone in my family with our son’s newborn session a few years ago, I am so happy to have gotten to celebrate a milestone of one of her littles as well.